First off, let me say that this isn't a paid review. I'm writing this article because I actually have an account with this brokerage. I'm writing this article because I have tried a number of the different online stock brokerages that are available to Canadians, so I think that I can give you a bit of insight on the subject. There are a number of different options that are available to you as a Canadian resident who is looking to open a brokerage account. You could open an account with your bank, but then you are going to get hit with much higher fees and commissions. You could open an account with a full service brokerage that might be located down the street from you, but then you will pay an arm and a leg for commission costs. If you are looking for an online brokerage and are a Canadian resident, then you already know that there are a number of discount brokerage options available to you. ThinkorSwim. E-Trade. Interactive Brokers. The list goes on and on. I've had an account at Thinkorswim. I've had an account at Interactive Brokers. 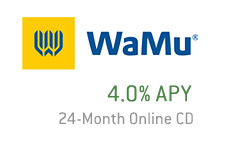 My favorite discount brokerage? Neither of the two. My favorite discount brokerage is Questrade. Questrade is a Canadian owned and operated (they are based out of Toronto) discount brokerage that has been in business for years. I've had an account with them since 2002, and I still have an account with them today. Back in the day, when I was deciding which brokerage I would open up my account with, I sent the same email to four different brokerages. The first one that responded, I said to myself, would likely get my business. Strong customer service is a very important trait for an online brokerage to have - you don't want to have to wait an hour to talk to someone when you REALLY need to talk to someone. Anyways, Questrade was the first to respond, and they responded on the WEEKEND. Ok, I said - I think I might be sold. Other reasons that I like Questrade? 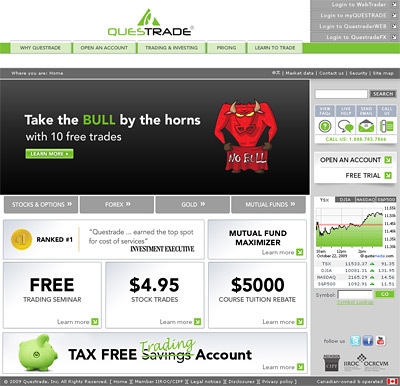 Questrade lets you trade a number of different financial instruments including: bonds, options, forex and gold. They also offer Tax Free Trading accounts for all of your Canadians out there who are familiar with TFSAs. There are numerous ways to get into contact with the company (email, phone, fax, online chat). As mentioned, their customer service representatives are very helpful and always on the ball (at least for me). Questrade also offers a number of different webcasts and online tutorials if you are just dipping your big toe into the world of online trading. Aren't sure if you want to deposit your hard-earned money at Questrade? Well don't worry, as the company offers a free trial of their various trading packages. Want to download their software to give it a whirl? Simply click here. Want to open an account, but need to know the promotional code to enter to qualify for your free trades? I really think that you'll enjoy Questrade - I know that I have. The company seems to be filled with good people who look out for the best interests of their customers, and that is always a very good thing.